Drawn from specimen found at Vekol Wash, Maricopa Co., AZ. Enlarged view of flower, calyx and bract at upper left. The flowers below were at Catalina State Park, Arizona, 30 July 2016. LEAVES: The stiff, abrasive-textured leaves are unique; indeed they fell like sandpaper. 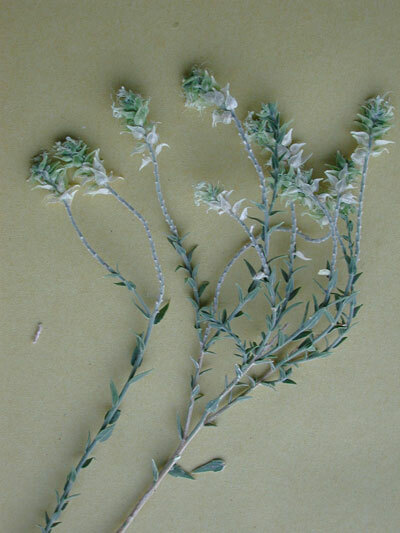 The elliptic leaves are alternate on the stems; the leaf margins have a few course teeth. RANGE: Sonoran Desert, usually growing within sandy washes. Ranges into the Mohave Desert of California and Nevada. SUBSHRUB/SHRUB: This plant sometimes grows low to the ground and above ground portions are only slightly woody. A meter-tall specimen in the Sonoran Desert would be a large specimen. During winter or extended drought this plant may be difficult or impossible to find. 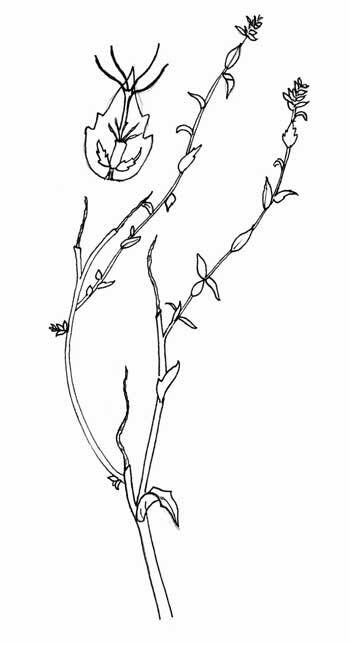 FLOWERS: The small, white flowers have a unique structure as shown in the sketch at upper left. 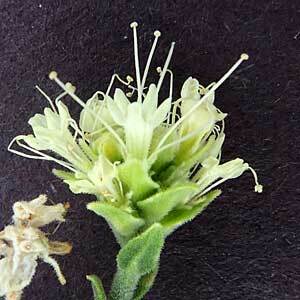 Four or five petals have long, narrow claws and extending above the petals are conspicuous white stamens. Each flower is further subtended by a triangular bract that later turns papery white. The flowers are borne on spikes and are crowded towards tip of the spike. Mid spring to fall. Queen butterflies may be seen visiting the flowers. UNARMED: No spines or thorns. This image is also hosted at Wikimedia Commons and was taken along the Gila River in Maricopa Co., Arizona on 11 Oct. 2007.